Stacking doors in the storage bay at Hills Factory. My father-in-law, Billy Wilson, worked at F Hills for many years as their chief engineer. His brother-in-law Jack/John Smelt was the MD. 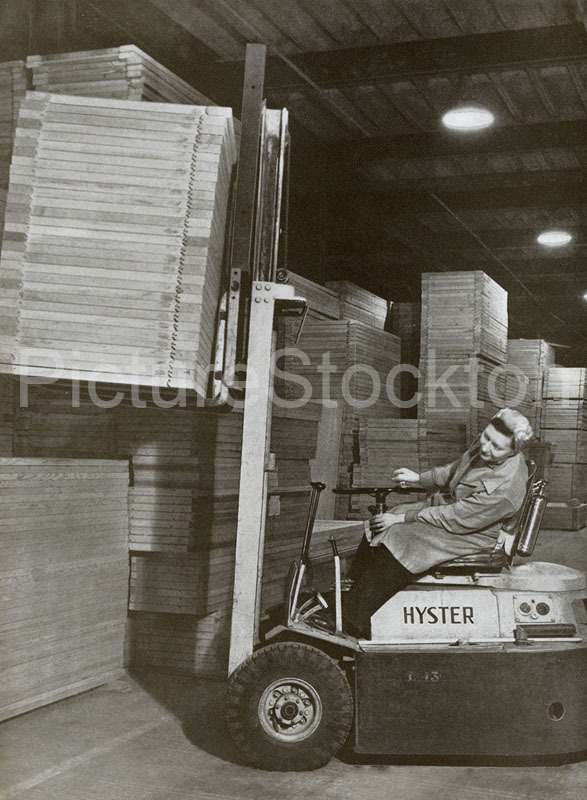 This was the 60’s when they were making vast numbers of Sapele flush doors for firms such as Wimpy. They also made award winning toilet cubicle systems. My husband Norman Mayes was a draughtsman in the drawing office in the late 50’s and early 60’s too. I was a secretary on the ground level so that’s where we met… thanks to the help of a girl called Val and another called Dorothy in the Drawing Office. In a few weeks Norm and I celebrate our 60th wedding anniversary. I used to work in the Drawing Office at Fred Hills in the late fifties and early sixties. They made anything in wood at one time, Window frames, Veneers, and even wooden Mosquito plane fuselages during the war. The mass door production came with the rise in house building well after the war with Panel Doors. They did at one time make good solid frame and panel doors. Some of the people who worked there in the early years could give more information. The rise in door manufacture and the door frames, which were made into door sets, doors fitted into frames was because of the start of high rise buildings. As each floor finished and the next one started Hills sent the essential units onto them.